Twisting metal is incredibly satisfying! 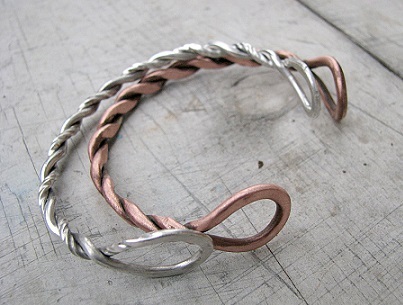 Create a circle from recycled copper or sterling silver by soldering the ends together. Learn the process to inherently anneal the wire making it soft and pliable. Using a vise to grasp the loop tightly, twist it into a cable forming your creation into a cuff bracelet. Two style choices. Choose sterling or copper at registration. Materials included. Ages 18 and up or 14-17 with adult.